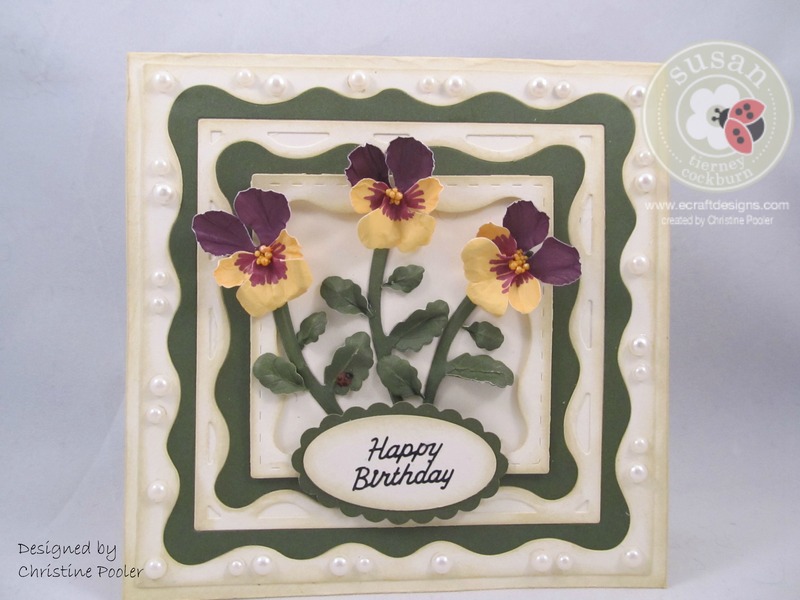 Hi Everyone my post today is a Birthday card that I designed using Susan’s Garden Notes Pansy die and Elizabeth Craft Designs Fitted Frames 4 Curvy die. The base of this card is a white A2 (4-1/4″ X 5-1/2″) all edges inked with Distress Ink Antique Linen. Using the Fitted Frames 4 – Curvy die cut 1 set in white cardstock and 1 set in green cardstock. Take frame 1,3 and 5 of the white and 2 & 4 of the green – ink all edges (you will be able to make another card with the remaining frames just reversing your the color layout of your frames) Attach the frames to the card front using double sided clear adhesive. Next die cut 3 pansies using Susan’s garden Notes – Pansie die (yellow and purple cardstock used here). Mark the centers of the yellow petals with a purple marker. Shape petals and assemble using Susan’s video seen here. Attach the pansies to the center of the frames. Punch a scallop oval from the green cardstock and an oval from the white cardstock ink edges. Attach the white oval to the scalloped oval. Attach “Happy Birthday” peel off sticker in the center of the oval. Using pop dots attach to the center bottom of the frames. Attach stick on pearls around the outside frame in each of the holes. I hope that you have enjoyed this tutorial today and it will inspire you to make your own card. What a beautiful card Christine! Love the combination with the fitted frames!